A popular food with almost all types of tropical fish krill are one of the prime choices for your aquarium larder. Rich in protein, they also contain carotenoids which bring our bright colours and help to show off your fish at their best. What's more, they contain vitamins and minerals which give a natural boost to the immune system. Whole krill are an excellent choice for larger fish, especially toothed fish who need something to crunch on. Smaller ones will enjoy crushed krill, and you can buy freeze dried preparations which have been pre-pulverised to make them easier for small mouths to manage. Even if they can't do the crunching themselves, your fish will benefit from eating the krill's chitinous exoskeletons, which help to build strong bones. Krill are quite rich for an everyday meal but can be fed as a treat once or twice a week or more frequently if you're conditioning your fish for breeding. Because of their strong, appetising smell, they can also be used to tempt fish who have gone off their food. As they contain so much roughage, krill should not be fed in any quantity to seahorses or other fish with delicate digestive systems. Commercial preparations containing shelled krill, however, can be suitable in these cases. 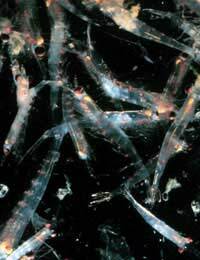 Krill are small ocean-dwelling crustaceans numbered amongst the zooplankton. They live in vast colonies numbering literally millions of individuals and so, despite their small size, they form a staple part of the diet of several kinds of whale. They are collected by trawling with very fine meshed nets and must be quickly processed after death before they break down. Most krill are collected in the Arctic and Antarctic waters, but populations are now suffering from the effects of changing climatic conditions. There are several species of krill, with some growing to over five inches in length and living for up to eleven years. They feed on phytoplankton and algae, converting these highly nutritious plants into a form which all fish can enjoy. Attempts have been made to keep them in captivity, and there are now captive populations available for scientific study, but they are difficult to maintain and are not currently viable as a commercial resource, so your fish will have to be content with frozen or dried ones. Some commercial pellet foods contain powdered krill, making all that flavour and nutrition more easily available to fussier fish. Whether you're trying to spark a bit of life back into an ailing fish or bring a healthy fish up to peak condition for breeding or showing, krill make an excellent conditioning food. Besides a high proportion of protein, they contain useful amino acids and Omega-3 fatty acids to improve overall health. Krill is particularly useful for bringing out red and orange pigments in your fish - they're the reason why salmon have their pink colour. When conditioning fish with a rich food, you should be extra careful to monitor water quality and provide good filtration, as you can expect an additional build-up of waste. This is particularly important with krill, as their chitinous shells also provide your fish with extra dietary roughage, improving the condition of their digestive systems. Krill grow by shedding and replacing their shells, so don't be surprised if you occasionally see what look like empty krill floating around in your aquarium. Nutritionally dense and full of energising carbohydrates, krill make an excellent food option for almost all omnivorous and carnivorous fish. Even large carnivores like sharks and rays will enjoy crunching on them from time to time. If you want to make your fish happy, consider krill the perfect treat!